Cranston, RI—A new ‘living system’ sculpture was recently installed in the University City/Big Bend Metro Station in St. Louis, MO. 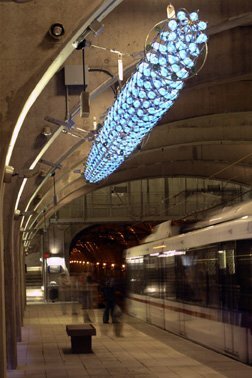 Entitled, “Linear Accelerator,” and created by artist Brower Hatcher and his Mid-Ocean Studio, the sculpture consists of two, 50-foot by 30-inch tapered tubular forms suspended beneath the arches of the station platform. Lit by LEDs in over 800 clear PC orbs molded by Fielding Manufacturing, the sculpture is equipped with interactive capabilities, and responds to the movement of pedestrians and trains in the station with pulsing patterns and changing colors. While the orb part is “not that complex,” according to Fielding, it did require good cosmetics for clarity and optical reflectance, and tight tolerances. The final design emerged as a hermaphroditic housing with an interlocking seal and notched flanges to support the board in plane with the parting line. A ribbing system was added to increase stability, and provision made for the addition of O-rings and a sealing gasket. Threaded inserts were added by Fielding during the molding cycle to improve strength, and cut an assembly step for the Mid-Ocean team. 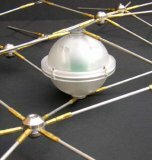 Mid-Ocean is also securing patents and investigating the commercial potential of the ‘living systems’ concept. They soon hope to market an Illuminated Matrix System™ product line to architects and designers. In the meantime, rail commuters in University City Station, St. Louis, MO, will no doubt be wondering just what is happening to the lights.